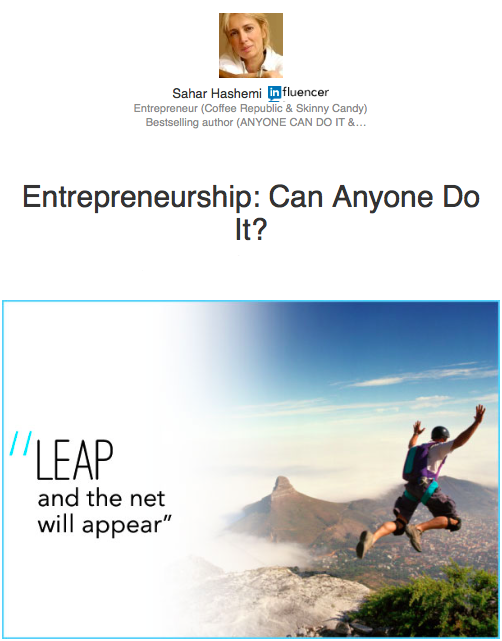 Entrepreneurship: Can Anyone Do It? Writing a book about our journey of starting Coffee Republic taught me one thing: yes, anyone can be an entrepreneur. Really. These days, entrepreneurs are everywhere, in the press and on TV shows like The Apprentice and Dragon’s Den, even on the big screen building a certain social network. But does exposure to all these successful entrepreneurs encourage more people to become entrepreneurs, or discourage them? At first it might seem like the obvious answer is that role models can only help nurture entrepreneurial dreams. But on further reflection I’m not so sure. I never thought I was the entrepreneurial type. When I was growing up there seemed to be just about one entrepreneur in the whole of the UK and his name was Richard Branson. Of course, when I compared myself to him, the swash-buckling extrovert, I knew I didn’t have it in me. I didn’t seem particularly creative in early childhood and hadn’t made money in the school playground. I wasn’t even a school drop out. So I went off and became a lawyer, a career that I considered to be the antithesis of entrepreneurship. But being a lawyer wasn’t for me. I wasn’t happy and I knew that I wasn’t playing to my strengths. I couldn’t be myself – my work persona was very different than the real me. Work and life felt like very separate things. I just couldn’t accept doing something that was the opposite of life for most of my waking hours through the best years of my life. When my father died suddenly, I decided that it was time to take the leap. Life was far too short to do something that wasn’t me. Fun, I decided, shouldn’t be reserved for weekends only. But I still didn’t think that starting my own business was an option. I still subconsciously must have had the image of Richard Branson hovering over me. So I left my job and went to see my brother Bobby who was living in New York. There I fell in love with the skinny lattes I tried at a new coffee chain called New World Coffee. When I got back home, I missed them. I wanted to start my mornings in London the same way I had in New York – with a skinny latte in a buzzy coffee bar. When I complained to my brother that I couldn’t get that in Britain, a light bulb went off for him. He had heard about Starbucks and he wanted to do his own thing, so he decided there and then that we should bring New York-style coffee bars to the UK. With a bit of coaxing, I agreed.